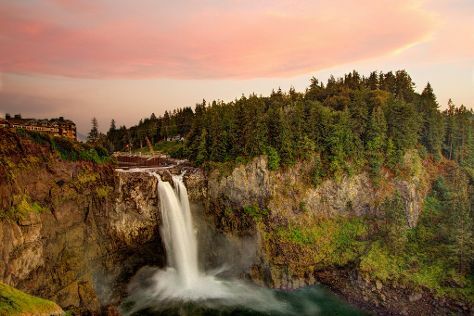 Start off your visit on the 6th (Sun): admire the sheer force of Snoqualmie Falls, stop by Boehms Candies, then admire the masterpieces at Chihuly Garden and Glass, and finally take in panoramic vistas at Space Needle. On the 7th (Mon), you'll have a packed day of sightseeing: examine the collection at The Museum of Flight, then tour the pleasant surroundings at Kerry Park, then take a leisurely stroll along Hiram M. Chittenden Locks, and finally wander the streets of Pike Place Market. Melbourne, Australia to Seattle is an approximately 21.5-hour flight. You can also do a combination of flight and shuttle; or do a combination of shuttle and flight. Traveling from Melbourne to Seattle, you'll gain 18 hours due to the time zone difference. Traveling from Melbourne in December, expect nights in Seattle to be a bit cooler, around 3°C, while days are cooler, around 9°C. Finish your sightseeing early on the 8th (Tue) to allow enough time to travel to Los Angeles. Explore hidden gems such as Rincon Bike Trail and Oceanside Pier. Visiting Carpinteria State Beach and Crystal Cove will get you outdoors. Venture out of the city with trips to Dolphin & Whale Watching (in Oceanside), Disneyland Park (in Anaheim) and Mission Basilica San Juan Capistrano (in San Juan Capistrano). There's more to do: see the interesting displays at The Getty Center. For more things to do, photos, maps, and other tourist information, use the Los Angeles trip website . Traveling by flight from Seattle to Los Angeles takes 5 hours. Alternatively, you can drive; or take a bus. When traveling from Seattle in December, plan for warmer days and a bit warmer nights in Los Angeles: temperatures range from 24°C by day to 11°C at night. Finish your sightseeing early on the 11th (Fri) to allow enough time to travel to Las Vegas. Explore hidden gems such as The Mob Museum and Wayne Newton's Casa de Shenandoah. Get a sense of the local culture at The Strip and Bodies The Exhibition. There's much more to do: explore the stunning scenery at Red Rock Canyon National Conservation Area, admire the local landmark of Bellagio Fountains, and see the interesting displays at Counts Kustoms. For reviews, ratings, and more tourist information, use the Las Vegas online trip itinerary maker . You can fly from Los Angeles to Las Vegas in 4 hours. Alternatively, you can drive; or take a bus. Plan for little chillier temperatures traveling from Los Angeles in December, with highs in Las Vegas at 16°C and lows at 4°C. Finish your sightseeing early on the 14th (Mon) to allow enough time to travel to Dallas. Kick off your visit on the 15th (Tue): steep yourself in history at Fort Worth Stockyards National Historic District, examine the collection at Amon Carter Museum of American Art, and then take in panoramic vistas at Reunion Tower. Get ready for a full day of sightseeing on the 16th (Wed): see the interesting displays at Perot Museum of Nature and Science, explore the world behind art at Nasher Sculpture Center, then examine the collection at The Sixth Floor Museum at Dealey Plaza, and finally pause for some photo ops at Dealey Plaza National Historic Landmark District. To see maps, more things to do, and other tourist information, use the Dallas trip planning tool . Traveling by flight from Las Vegas to Dallas takes 6 hours. Alternatively, you can drive; or take a bus. The time zone changes from Pacific Standard Time (PST) to Central Standard Time (CST), which is usually a 2 hour difference. Expect a daytime high around 17°C in December, and nighttime lows around 5°C. Wrap up your sightseeing on the 16th (Wed) to allow time to travel to Houston. On the 17th (Thu), admire the masterpieces at Museum of Fine Arts, Houston and then immerse yourself in nature at Brazos Bend State Park. Here are some ideas for day two: examine the collection at Space Center Houston, explore the world behind art at Bayou Bend Collection and Gardens, and then examine the collection at Houston Museum of African American Culture. For photos, maps, reviews, and tourist information, read our Houston travel planner . Traveling by flight from Dallas to Houston takes 4 hours. Alternatively, you can drive; or take a bus. Prepare for somewhat warmer weather when traveling from Dallas in December: high temperatures in Houston hover around 22°C and lows are around 11°C. Wrap up your sightseeing on the 19th (Sat) to allow time to travel to New Orleans. Get a sense of the local culture at Garden District and St. Louis Cathedral. Escape the urban bustle at Jean Lafitte National Historical Park and Preserve and Woldenberg Park. Take a break from New Orleans with a short trip to Whitney Plantation in Wallace, about 54 minutes away. There's lots more to do: get to know the fascinating history of Royal Street, learn about all things military at The National WWII Museum, paddle through the water with a kayaking and canoeing tour, and admire the landmark architecture of Destrehan Plantation. For maps, more things to do, ratings, and more tourist information, read our New Orleans tour itinerary website . You can fly from Houston to New Orleans in 4 hours. Other options are to do a combination of flight and car; or drive. When traveling from Houston in December, plan for little chillier days in New Orleans, with highs around 16°C, while nights are somewhat warmer with lows around 16°C. Finish up your sightseeing early on the 22nd (Tue) so you can travel to Miami. Escape the urban bustle at Everglades National Park and Anhinga Trail. Get a sense of the local culture at Vizcaya Museum and Gardens and Art Deco Historic District. Go for a jaunt from Miami to Homestead to see Homestead Historic Town Hall Museum about 50 minutes away. There's still lots to do: take a stroll through Collins Avenue, view the masterpieces at Britto Central, and get a taste of the local shopping with Lincoln Road. To see maps, more things to do, photos, and more tourist information, use the Miami trip maker website . Traveling by flight from New Orleans to Miami takes 4.5 hours. Alternatively, you can do a combination of flight and bus; or drive. You'll lose 1 hour traveling from New Orleans to Miami due to the time zone difference. When traveling from New Orleans in December, plan for much hotter days in Miami, with highs around 32°C, while nights are a bit warmer with lows around 23°C. Wrap up your sightseeing on the 25th (Fri) early enough to travel to New York City. Step out of the city life by going to Ski Big Bear and Shawangunk Mountains. Do some cultural sightseeing at 9/11 Memorial and Stone Church. Explore New York City's surroundings by going to Hawk's Nest Highway (in Port Jervis), High Point Cross Country Ski Center (in Sussex) and Balloon Rides (in Middletown). There's lots more to do: go for a walk through Central Park, immerse yourself in nature at Minnewaska State Park Preserve, take your sightseeing to a higher altitude at Anthony's Nose, and meet the residents at Trevor Zoo. To see photos, reviews, more things to do, and other tourist information, go to the New York City trip planner. Traveling by flight from Miami to New York City takes 5.5 hours. Alternatively, you can do a combination of flight and bus; or drive. Plan for cooler temperatures traveling from Miami in December, with highs in New York City at 10°C and lows at 2°C. Cap off your sightseeing on the 2nd (Sat) early enough to travel to Boston. Start off your visit on the 3rd (Sun): explore and take pictures at Fenway Park, then admire the masterpieces at Museum of Fine Arts, and then explore the galleries of New England Holocaust Memorial. Keep things going the next day: explore the different monuments and memorials at Granary Burying Ground, then wander the streets of Beacon Hill, then contemplate in the serene atmosphere at Old North Church & Historic Site, and finally get to know the fascinating history of Freedom Trail. For traveler tips, where to stay, photos, and tourist information, read our Boston trip planner. Do a combination of bus and flight from New York City to Boston in 3 hours. Alternatively, you can fly; or drive. Expect a daytime high around 3°C in January, and nighttime lows around -5°C. 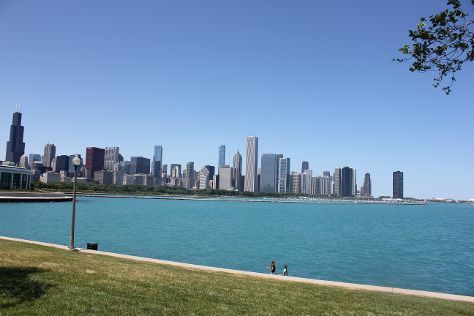 Wrap up your sightseeing on the 4th (Mon) early enough to travel to Chicago. On the 5th (Tue), hike along Lakefront Trail, admire nature's wide array of creatures at Lincoln Park Zoo, then get to know the fascinating history of Millennium Park, and finally appreciate the history behind Cloud Gate. Keep things going the next day: explore the landscape on two wheels at The 606, then explore the world behind art at The Art Institute of Chicago, then contemplate the waterfront views at Chicago River, and finally explore the activities along Lake Michigan. For other places to visit, photos, reviews, and tourist information, go to the Chicago trip itinerary builder tool . You can fly from Boston to Chicago in 4 hours. Other options are to do a combination of bus and flight; or drive. The time zone changes from Eastern Standard Time (EST) to Central Standard Time (CST), which is usually a -1 hour difference. Traveling from Boston in January, expect Chicago to be little chillier, temps between 0°C and -9°C. Wrap up your sightseeing on the 7th (Thu) to allow time to travel to San Jose. On the 7th (Thu), get engrossed in the history at Rosicrucian Egyptian Museum, then take an in-depth tour of Computer History Museum, and then admire the majestic nature at Henry Cowell Redwoods State Park. On the 8th (Fri), you'll have a packed day of sightseeing: kick back and relax at Natural Bridges State Beach, kick back and relax at Capitola Beach, and then take in the architecture and atmosphere at Cathedral Basilica of St. Joseph. To see where to stay, more things to do, traveler tips, and tourist information, use the San Jose trip planner . Getting from Chicago to San Jose by flight takes about 6.5 hours. Other options: do a combination of flight and train; or drive. The time zone changes from Central Standard Time to Pacific Standard Time, which is usually a -2 hour difference. Plan for much warmer temperatures traveling from Chicago in January, with highs in San Jose at 19°C and lows at 6°C. Finish your sightseeing early on the 9th (Sat) so you can drive to San Francisco. Do some cultural sightseeing at Alcatraz Island and SS Jeremiah O'Brien. Escape the urban bustle at Muir Woods National Monument and Twin Peaks. And it doesn't end there: snap pictures at Golden Gate Bridge, get engrossed in the history at Tenderloin Museum, contemplate the long history of City Lights Booksellers, and see the interesting displays at San Francisco Maritime Museum/Aquatic Park Bathhouse Building. To see other places to visit, maps, photos, and more tourist information, you can read our San Francisco road trip planning site . Drive from San Jose to San Francisco in an hour. Alternatively, you can take a bus; or do a combination of bus and subway. January in San Francisco sees daily highs of 17°C and lows of 9°C at night. Wrap up your sightseeing on the 12th (Tue) to allow time to travel back home.